Atlantis installed one 1000kW tidal engery conversion device (AK-1000), at the fall of Warness tidal energy test site at EMEC in 2011. The device was due to be operationale in August 2010; however, due to technical problems the site was delayed until August 2011. The device operates with two sets of blades, which are fitted on a single unit, the AK-1000 tidal turbine to tackles reflux and flood tides. The diameter of each blade is 18m, and they rotate slowly at a rate of six to eight revolutions a minute, resulting in low environmental impact. South Seal Skerry (West Coast of Eday) Orkney. Water Depth: 33m LAT. Lat (WGS84): 59°8’59.899" N. Long (WGS84): 2°49’37.301" W. Tidal range: 3m. Tidal speeds up to 3.7 m/s. 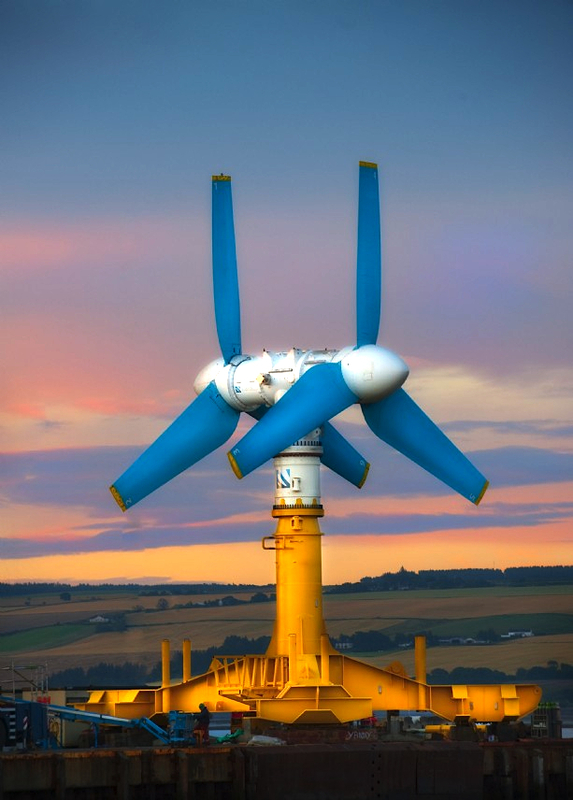 The AK-1000 tidal turbine was planned to be installed in August 2010 at EMEC’s test sites, Orkney. However, due to construction issues, the installation was delayed until August 2011. After a 12 month period, the Mark 1 device will be replaced by a Mark 2 turbine. The Mark 2 turbine will have identical dimensions as the Mark 1 turbine, and will be able to maintain a maximum power output of 1MW. The GBS (Gravity based structure) will not need replacing. As part of the decommissioning plan in 2004, Atlantis operations Ltd applied for two consultation rounds. The first was sent to 16 DECC (formerly DTI/BERR) specific stakeholders including; The Chamber of Shipping, Historic Scotland, Orkney Fisheries Association and the Orkney Island Council. The second report produced to apply towards specific government departments, including; CEFAS, Marine Scotland, The Crown Estate and The UK Hydrographic Office. The stakeholders had a statutory 30days to provide consultation Reponses. Atlantis Resources Corporation at EMEC is located in United Kingdom. Noise and vibrations from vessels engine could cause disturbance to wildlife – Presence of international, nationally and locally important species including seals, cetaceans and birds. Desk based review. Consultation with statutory and non-statutory stakeholders. Little known data on the impact of DP vessels in shallow water, but the noise output may be similar to the cumulative noise output of several vessels. Winds in Orkney average force 3, and in winter force 6. Atmospheric emissions are rapidly depressed naturally. Wildlife disturbance due to vessel presence and use of DP system – Presence of international, national, and locally important species including seals, cetaceans and birds. Over a vessel present for 1 day with regular use of thrusters to maintain position. Hazard to navigation from presence of vessel. Risk migration/controls determined by the NSRA. The work will be broadcasted by appropriate notices to mariners and navigational warnings. The removal of the nacelle, cable disconnected and GBS removal expected to be a maximum three days of activity. The fall of Warness will still be navigable around the proposed works. Impact of local fisheries (including diving fishermen). Test site boundary/lease area has been reduced based on consultations undertaken with fishermen representatives since initial site establishment. Seabed habitat disturbance from removal of GBS – no protected seabed habitats or species of conservation importance present. GBS removal not expected to greatly disturb the predominately bedrock seabed. Lack of mobile sediments negates scour or sediment redistribution issues. The nacelle will be disassembled and extensively studied following testing to inform future design improvements. Once investigations are completed all components will be handled in accordance with waste hierarchy with priority on re use and recycling. Any items disposed of will be done so in line with legislative requirements to avoid unnecessary environmental impact. All subcontractors will have valid shipboard marine pollution emergency plans, which include a shipboard oil pollution emergency plan (SOPEP) or equivalent procedures as required. Handling equipment used are tested and designed to withstand large loads. Any lessons learned during the installation phase will be implemented as required during decommissioning. Degradation to the quality or availability of habitats and/or wildlife with recovery taking more than 2 years. Change in habitats or species beyond natural variability with recovery potentially within 2 years. Change in habitats or species which can be seen and measured but is at same scale as natural variability. Change in habitats or species within scope of existing variability and difficult to measure or observe. Atlantis Resource Cooperation. (2012). EMEC Decommission Programme.